All 6’s and 7’s – The Tour is coming to a city near you! We’re laying out the locales on the tour one by one, in hopes that fans from the cities will come out to represent their town and also so the out-of-towners know what they’re getting into. The fifth city on the tour is Missoula, Montana. Tech N9ne and company (¡Mayday!, Stevie Stone, Jay Rock, Krizz Kaliko, Kutt Calhoun, and Big Scoob) will perform at the Wilma Theatre on May 31, 2011. Fans described Missoula as a town where the vibe is always right! 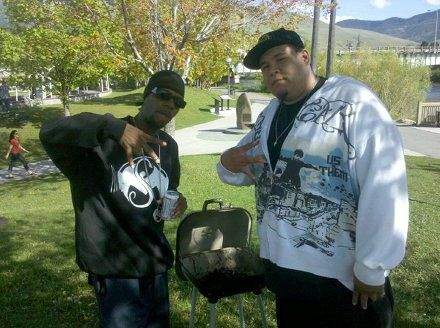 Check out this fan pic taken with Brotha Lynch Hung during their Missoula stop on the Strange Days Tour! We had fans from Missoula call in and represent along with the Techn9cians in Billings, Montana; Kansas City, Missouri; and Wichita, Kansas. Listen below to hear how they all came out to represent. Make sure you check out All 6’s and 7’s – The Tour as it runs through Missoula, Montana on May 31, 2011. 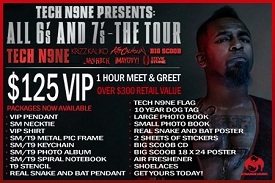 Also remember to reserve your VIP Packages for the show, which includes exclusive merchandise and a Meet and Greet with Tech and your favorite Strange Music artists. They’re running out quick so it’s best to get them while you still can! Wilma Theater on May 31, 2011, see you there! The All 6’s And 7’s Tour is still going strong as it makes waves through Montana. The first stop in Missoula, Montana left fans in awe as Stevie Stone, ¡Mayday!, Jay Rock, Krizz Kaliko, and Kutt Calhoun tore down the Wilma Theatre before Tech N9ne took the stage and delivered another crushing performance. Fans in Missoula are no doubt feeling the aftermath of Strange Music’s powerhouse entertainment. Tech N9ne continues his takeover in Billings, Montana.